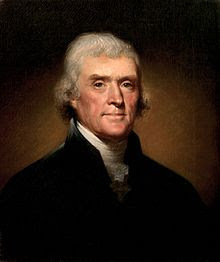 IN THE battle over how to teach evolution in public schools, Thomas Jefferson’s demand for a “separation between church and state’’ has been cited countless times. Many argue that the controversial alternative to Darwinian evolution, intelligent design, is an exclusively religious idea and therefore cannot be discussed under the Constitution. By invoking Jefferson’s principle of separation, many critics of intelligent design assume that this visionary Founding Father would agree with them. But would he? For too long, an aspect of Jefferson’s visionary thought has been ignored, hidden away as too uncomfortable for public discussion - his support for intelligent design. In 1823, when materialist evolutionary ideas had long been circulating, Jefferson wrote to John Adams and insisted that the scientific evidence of design in nature was clear: “I hold (without appeal to revelation) that when we take a view of the Universe, in its parts general or particular, it is impossible for the human mind not to perceive and feel a conviction of design, consummate skill, and indefinite power in every atom of its composition.’’ It was on empirical grounds, not religious ones, that he took this view. This discovery has made acute a longstanding scientific mystery that Darwin never addressed or solved: the mystery of how the very first life on earth arose. To date no theory of undirected chemical evolution has explained the origin of the digital information in DNA needed to build the first living cell on earth. Yet modern scientists who argue for intelligent design do not do so merely because natural processes have failed to explain the origin of the information in cells. Instead, they argue for design because systems possessing these features invariably arise from intelligent causes. DNA functions like a software program. We know that software comes from programmers. Information - whether inscribed in hieroglyphics, written in a book, or encoded in a radio signal - always arises from an intelligent source. So the discovery of digital code in DNA provides a strong scientific reason for concluding that the information in DNA also had an intelligent source. Design is an inference from biological data, not a deduction from religious authority. Jefferson said just that, and based his political thinking on it. The evidence for what he presciently called “Nature’s God’’ is stronger than ever. Our nation’s existence, with its guarantee to protect each person’s “inalienable rights,’’ may be counted among the fruits of Jefferson’s belief in intelligent design.